before another month has gone. WOW this year is flying by! 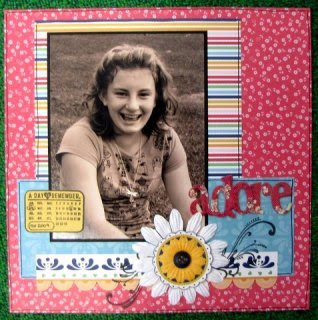 I have been scrapping & finally had the time to get some pic's for another blog share. Thanks for visiting & I hope you have a great week! Well I won't try to explain my lack of blogging apart from saying that everyday life has been busy of late. I would also like to wish all the mums out there a very happy Mothers Day for tomorrow. I hope you all get very spoilt & can spend the day with those that you love. I know I will be. I have been scrapping up a storm of late & will share a few pages with you. I will leave it at that for now & will share another post real soon - I promise! Thank you to everyone that visits. I love reading the lovely comments & please forgive me for my lack of blogging.